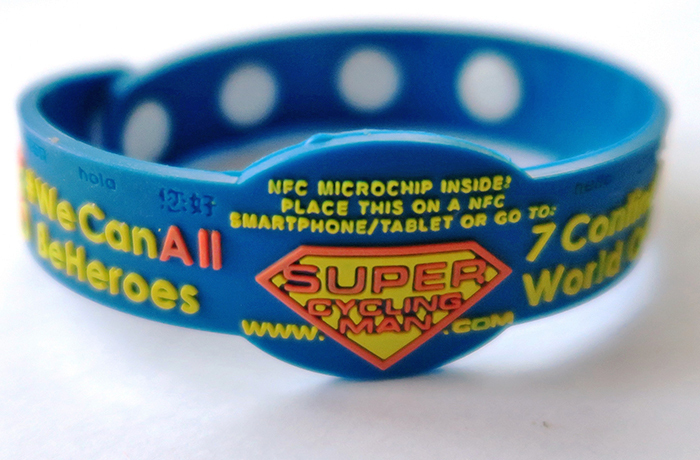 Look totally SUPER and help support me on my charity world cycle with your very own SuperCyclingMan wristband! £1 goes to the charity Parkinson’s UK and £1 goes to buy me some food and drink to keep my world cycle going. Help keep me going on my charity world cycle and buy a SuperCyclingMan wristband for just £2 (plus P&P). Improve your geography and language skills – Each wristband is embossed with the word “hello” in 15 different languages and a world map showing the 7 Continents I aim to cycle across on my 7 year long round the world bike ride. One size fits all. The length of each wristband can be altered using the four press studs, making them a perfect accessory for any sized wrist, big or small. WOW your friends with the wristband’s clever microchip feature. Hold the wristband up to your smartphone or tablet (excluding Apple devices, sorry) and you’ll be taken straight to a live map on my website to show my precise current location in the world without typing a thing! Magic! The wristbands will be delivered to you in the post by my UK-based logistics team (my Super Mum and Dad), so please allow up to 28 days for delivery, although we will try and get them to you far sooner than that.